When I was little and couldn’t sleep at night, there was a giant bear who arrived at the foot of my bed and sing lullabies of dark blue and fresh green. He gave me songs of faery wings and jewels growing in caverns deep inside the earth. I coaxed the bear into my twin bed and somehow, we fit perfectly together. He asked me never to look upon his face. I was asked for one thing. 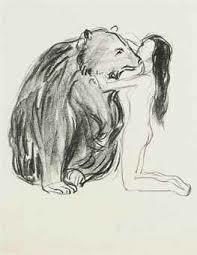 The bear made one demand of me, only one promise. But that promise ate at me and I could feel it gnawing when I stepped outside at dusk to play for one more hour. I felt it hissing as I drank my milk in the morning. Who was the bear? Why can’t I see his face? Something must be wrong. And once that viral thought took hold, it began to invade every cell like fire, like ice. Something is wrong. This makes no sense. Why did the bear come? And suddenly the songs of foxes crooning and snow tumbling on the lowest rushing river no longer seemed comforting. In fact, they seemed jagged, uncivilized. I begged the bear to show me his face. Only once, only for an instant to ease my spinning mind and steady my trembling hand. He growled at me to never to speak of it again. As always, there was a mother. This one did nothing to ease my fears. Instead, she brought new ones. As I grew older and into my female body, she pelted me with questions. How did the bear get in the house? What did he want? Could a bear ever be trusted? She gave me a brass candlestick and some wax made from the most industrious bees. She instructed me to wait until the bear fell asleep. Then, light the candle and illuminate his face. He would never know I did it. If it was the face of a beast, I would sneak away and get help. If I felt warmly towards his face, I could rest again, light in my bones. Of course, I took the candle to bed, hiding it and a book of matches under the coverlet. I stayed awake until my bear came in, drenched in light from the full hunters moon. He sang me songs of salmon jumping, lightning splitting the sky, the first forest and kestrels swooping. He folded himself around me, dark fur smelling like autumn. He drifted down the river of sleep. I listened for the deepening of his breath and produced the candle. I set the stick on the bedside table and struck a match. On my third try, I lit the candle and lifted it to gaze upon him. My bear became the most radiant young person, wild, angelic, androgynous, fey. This face had seen thousands of suns. 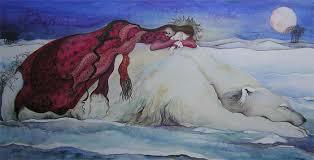 The candle dribbled and one drop of hot wax fell upon the bear skin, sizzling. The golden being awoke and saw me with the candleglow, open mouth, my own skin burning with a bitter fire of shame. I broke the one vow. He was gone before I spit out a word. 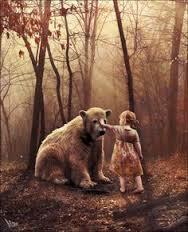 What if you loved a bear who sang to you and wrapped himself around you and then disappeared? What he made himself your bearloverfriend and protector? What if you sang back to him, unafraid, standing on your own legs? What if you began to whisper, I love you for always? What if you found something inside yourself that was so much larger and dangerous than what you thought? What if he bit you and you bit him back? What if you become lost in that bear? What if he disappeared at peak hunting season because he no longer wanted you? How would you find him? Where do you look for the wild things you have lost?